Poor Arsenal. Just when Gunners fans were feeling superb about themselves - as they emphatically were after vanquishing Bayern Munich - something comes along to knock them back into their place, and today that something is Lionel Messi. In the undisputed hottest piece of Hot Football Transfer Gossip of this cold and lonely autumn, the Sun has claimed that the Argentine superstar is on his way to the Premier League. Maybe. Either to Manchester United, or Manchester City, or Chelsea. Maybe. The three English giants have reportedly made approaches to Barcelona about their star player, who is apparently in a filthy mood about his ongoing issues with the Spanish tax authorities. Making a mere approach for Messi wouldn’t normally mean much - there’s nothing to stop Port Vale making an approach, for instance - but the Sun says that this time the English clubs have been given “encouragement”. And that Messi has “given the clearest hint yet he is ready to listen” to offers from the Premier League. He wouldn’t be cheap, mind. The release clause in Messi’s contract is about £180m. 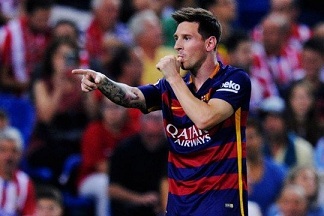 But the Sun reckons that in 2017, when he only has a year left on his current deal, Barca might be ready to talk. Is this the most far-fetched transfer rumour ever, or the best? Only you can decide. And what has this got to do with Arsenal? Nothing. Nothing at all. Poor Arsenal. Another juicy piece of today’s gossip is that Tottenham are interested in Hazard, but - thankfully for those Gunners fans - it’s not Eden, it’s his brother Thorgan. The Daily Mail says Spurs have been “maintaining a watching brief” on the 22-year-old midfielder, who has impressed for Borussia Monchengladbach since leaving Chelsea last summer. Liverpool boss Jurgen Klopp, who said last week that he wouldn’t be signing any of his ex-players from Borussia Dortmund, is reportedly going back to Borussia Dortmund to sign one of his ex-players. That’s according to the Metro, which says Klopp is interested in bringing Turkish midfielder Nuri Sahin to Anfield. Maybe there’s a loophole that allows Klopp to sign ex-Dortmund players as long as they are also ex-Liverpool players. One of Klopp’s alleged main targets, Porto’s 18-year-old Ruben Neves, is apparently not for sale, says the Daily Mail. While a player who might be for sale - but would be rather expensive - is Athletic Bilbao defender Aymeric Laporte, who the Express says will cost Chelsea or Man Utd £35m. Even then he’d probably be better value than the Blues’ high earner Radamel Falcao, who is being linked by the Mirror with a January move to Fiorentina.